Located on West Point, the West Point Association of Graduates (WPAOG) proudly serves as both the alumni association and fundraising arm for the United States Military Academy. Our mission is “to serve West Point and the Long Gray Line”—all hearts in gray—including you and your cadets. WPAOG functions as the Academy's fundraising arm because military personnel and representatives of the federal government are prohibited by law from soliciting funds, goods, or services. Why does WPAOG seek annual support for West Point? Contrary to popular belief, the United States Military Academy is not funded solely by federal tax dollars. While the Academy receives federal funding to support its core programs, which provide the basic requirements to earn a Bachelor of Science degree and a commission in the United States Army, many projects and activities that are of great value but outside the "core" designation receive minimal to zero funding from the government. These programs are needed in a highly competitive environment to recruit and educate the very best. This is why private funding from our alumni, parents and friends is so important—it fills the gap and supports unique experiences and extraordinary developmental programs that go above and beyond the Academy’s core programming to create the Margin of Excellence and provide an educational environment like no other. We are proud to say that with the support of our alumni, parents and friends, West Point is the #1 public college in our Nation, ranked recently by Forbes magazine. 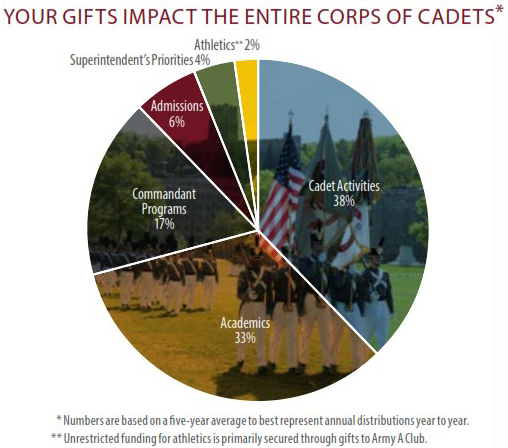 Every year, parents are asked to support the Margin of Excellence by making a gift to the West Point Parents Fund, a subset of the Superintendent’s Annual Fund that supports the needs of the Academy and Corps of Cadets. Parents will receive a letter with information about the Margin of Excellence, followed by a phone call from a West Point representative to discuss the Annual Fund. WPAOG works diligently with an outside vendor, Advantage Plus, to reach our 60,000+ alumni, parents, and friends each year. Advantage Plus reaches out to parents of upper class cadets throughout the year, while parents of Plebes are called only September through November. Additional correspondence may come via mail, phone, and email throughout the year from WPAOG. West Point and WPAOG truly appreciate the steadfast commitment and generous support of all our donors. Your support makes a tremendous impact on the Corp of Cadets—the future leaders of our Army and nation. We hope that you come to know WPAOG as your “home away from home” and see it as a valuable resource for your family now and in the future.